A developmentally appropriate curriculum for young children is planned to be appropriate for the age span of the children within the group and is implemented with attention to the different needs, interests, and developmental levels of those individual children. The concept of developmental appropriateness has two dimensions: age appropriateness and individual appropriateness. Human development research indicates that universal, predictable sequences of growth and changes occur in early childhood and in all areas of development – physical, emotional, social, and cognitive. Knowledge of typical development of children within the age span served by the program provides a framework from which teachers prepare the learning environment and plan appropriate experiences. Because each child is a unique person with an individual pattern and timing of growth, as well as an individual personality, learning style, and family background, both the curriculum and the teachers’ interactions with a child should be responsive to individual differences. Learning in young children is the interaction between the child’s thoughts and experiences with materials, ideas, and people. These experiences should match the child’s developing abilities, while also challenging the child’s interest and understanding. Our curriculum goals encompass experiences provided to meet the children’s needs and stimulate learning in all developmental areas – physical, social, emotional, and intellectual. 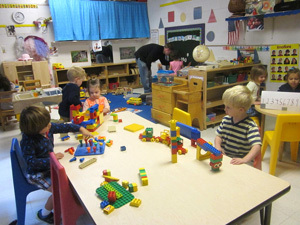 All interactions and activities are designed to develop children’s self-esteem and positive feeling toward learning.